Advisers to President-elect Donald Trump are developing plans to reshape Energy Department programs, help keep aging nuclear plants online and identify staff who played a role in promoting President Barack Obama’s climate agenda. Step 1: identify expertise and any possible source of civil-service resistance to the illegitimate power grab. Step 2: harass the key figures into resignation, or, failing that, post them to sheep-flatulance monitoring posts in the Dakotas. Step 3: replace with loyalists. Consolidate long term holds over policy in the agencies. Capture government statistical reporting and the representation of reality. The Trump transition team has issued a list of 74 questions for the Energy Department, asking officials there to identify which department employees and contractors have worked on forging an international climate pact as well as domestic efforts to cut the nation’s carbon output. One question zeroed in on the issue of the “social cost of carbon,” a way of calculating the consequences of greenhouse gas emissions. The transition team asked for a list of department employees or contractors who attended inter-agency meetings, the dates of the meetings, and emails and other materials associated with them. Another question appeared to delve deeply into the mechanisms behind scientific tools called “integrated assessment models,” which scientists use to forecast future changes to the climate and energy system. It even asked what the Energy Department considers to be “the proper equilibrium climate sensitivity,” which is a way that climate researchers calculate how much the planet will eventually warm, depending upon the amount of greenhouse gases emitted into the atmosphere. There’s lots more at the link. None of it good. These are f**king dangerous people. For the thousands hoping to echo the civil rights and anti-Vietnam rallies at Lincoln Memorial by joining the women’s march on Washington the day after Donald Trump’s inauguration: time to readjust your expectations…. The NPS filed a “massive omnibus blocking permit” for many of Washington DC’s most famous political locations for days and weeks before and after the inauguration on 20 January, said Mara Verheyden-Hilliard, a constitutional rights litigator and the executive director of the Partnership for Civil Justice Fund. The National Park Service applied for the blocking permit on behalf of the Presidential Inauguration Committee — i.e., Trump’s donors and apparatus. Again: this is how would-be dictators work, taking control of the bureaucracy and squeezing civil space. We’ve a long road ahead. My small act of resistance today is to call my representatives (Warren, Markey, Kennedy) to urge them to publicly condemn the emerging civil service witch hunt. Whatever y’all can do, please have at it. 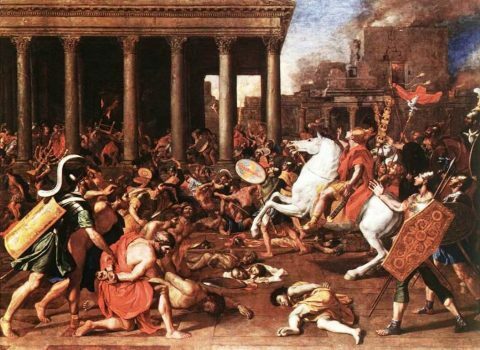 Image: Nicholas Poussin, The Destruction of Jerusalem, 1637. Explore posts in the same categories: Trump Crime Syndicate, Uncategorized, Why Do They Hate America So? This entry was posted on December 9, 2016 at 12:41 pm and is filed under Trump Crime Syndicate, Uncategorized, Why Do They Hate America So?. You can subscribe via RSS 2.0 feed to this post's comments. The latest — that I’ve seen — is that the DOE is telling Trumpolini where to put his little inquisition.